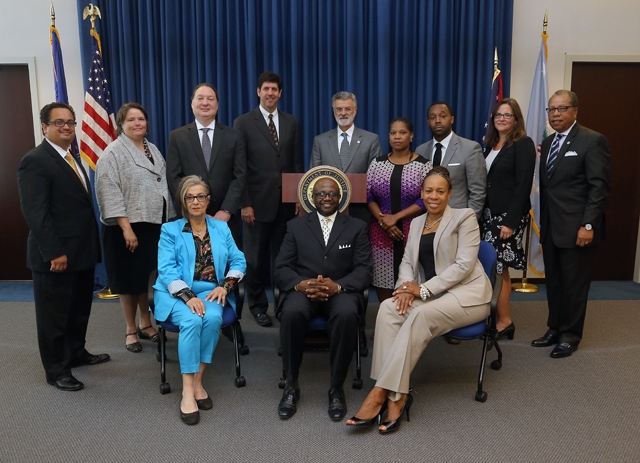 Mayor Frank G. Jackson and U.S. Attorney Steven M. Dettelbach announced today the appointment of an 11-member selection panel that will have the duty to appoint 10 representatives to the City of Cleveland Community Police Commission, as detailed in the agreement between the City of Cleveland and the U.S. Department of Justice. “I have confidence in this panel to accomplish their goal of selecting qualified members for the Community Police Commission and to keep the city on track as we continue down the Road to Reform,” said Mayor Jackson. “It is now time for this impressive panel to independently select 10 members of Cleveland’s first-ever Community Police Commission, said U.S. Attorney Dettelbach. The Community Police Commission will be comprised of 13 members, 10 selected by the newly formed selection panel and three selected by City of Cleveland police unions. The Community Police Commission will make recommendations to the Chief of Police and the City, including the Mayor and City Council, on policies and practices related to community and problem-oriented policing, bias-free policing and police transparency. Victor A. Ruiz, Executive Director, Ezperanza Inc.
Click here to read short biographies of each selection panel member. The selection panel will ensure that members of the Community Police Commission include one representative from faith-based organizations, civil-rights advocates, the business/philanthropic community, organizations representing communities of color, advocacy organizations, youth or student organizations, academia and individuals with expertise in the challenges facing people with mental illness or the homeless. Additionally, the Cleveland Police Patrolmen’s Association, the Fraternal Order of Police and the Black Shield will each select a representative to serve on the Commission.